F.C.F. was established in June in 2011 about three months after the outset of the Fukushima nuclear incident. For the Fukushima nuclear incident victims, F.C.F. as a sister group of the Chernobyl Children’s Fund, Japan is now trying to make the most of its twenty years of experience with the Chernobyl nuclear incident victims. 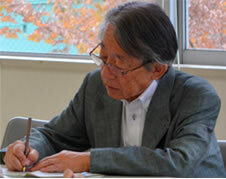 Mr. Kurobe, born in Tokyo in 1941, graduated with a degree in medicine from Keio University. He worked as a pediatrician at Saitama National Hospital, at Fukiage Kyoritsu Clinic, and at Horinouchi Clinic. Since 2012 he has worked as the director of the Suzushiro Clinic. He started the movement of reducing medical radiation exposure and achieved one of his goals, the abolition of chest x-ray exams at elementary and junior-high schools in Japan. It was because he saw many people who unnecessary exposed to radiation as a result of careless x-ray exams. Hearing about his achievement, C.C.F.J. asked him to be its adviser. After the March 2011 nuclear incident, he became the head of Fukushima Children’s Fund in order to support the Japanese children. Copyright © 2015 FUKUSHIMA CHILDREN'S FUND. All rights reserved.